Lola Tampons Review: LOLA delivers organic tampons, pads and liners to your door as part of a customizable subscription service. You get to choose how many boxes you want, when you want them shipped and how often you want them shipped. The packaging is discrete, the pricing is good, the product lives up to its marketing claims, and the experience opening the aesthetically pleasing box rivals what you get buying products from Apple or Warby Parker. LOLA also provides you a feel-good factor when you purchase natural tampons and toxin-free feminine hygiene products. Since it launched, LOLA has donated over 1,000,000 tampons to low-income women and girls across the US in 27 states, 60 cities, and 100+ shelters. What Are LOLA Hypoallergenic Tampons Made Of? Can I receive a Lola tampons sample? Does Lola make organic tampons? 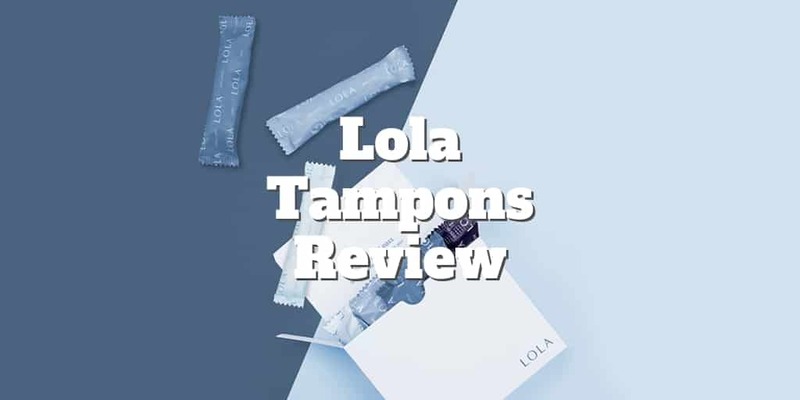 Lola tampons reviews: customer rating? LOLA, which is also called MyLOLA, was founded by two entrepreneurial women, Alexandra Friedman and Jordana Kier, who identified a problem in feminine care and decided to solve it. The story of LOLA began when the two co-founders researched feminine hygiene products but couldn’t figure out what was inside them. They realized the problem of lack of transparency about what women were putting into their bodies existed and decided to create organic tampons with no toxic ingredients. Did you know that some tampons are made with polyethylene? Alexandra and Jordana say they didn’t know what polyethylene was but for years they had been putting it in their bodies via brand name tampons. They knew an opportunity for greater transparency existed, and LOLA was born. As a testament to how well the co-founders have succeeded, Lola tampons reviews have been almost universally positive. So how does MyLola work? The step-by-step process of selecting feminine products (read: My Lola Tampons) from LOLA involves first picking the organic cotton product that meets your needs. Once you have selected your product, choose your assortment options that are customizable to meet your needs. Next choose how many boxes you want so that you’re prepared for upcoming cycles. And finally, select the frequency with which you would like to receive your LOLA tampons, pads and liners. For example, you could get two boxes shipped to you every other month. LOLA gets extra brownie points for its no commitments policy; you can modify, skip or cancel your box anytime. As a company founded by women for women, these thoughtful features go a long way towards winning customer loyalty. LOLA is highly customer-focused, which is evident in many small ways. For example, if you want to skip a month for some reason, you won’t get charged. It’s not like a gym membership that obligates you to pay regardless of whether you use it. At LOLA, you pay only for the boxes you get. After your initial orders, prices increase for ongoing monthly subscriptions. A first period can come as a shock and preparing as much as possible can help to alleviate the surprise of a first menstrual cycle and period pain. LOLA tries to ease the experience by preparing parents for their daughter’s first period with a First Period Kit, which is complete with necessary products and instructions. LOLA worked with leading pediatrician, Dr. Lisa Stern, to create a free, downloadable e-book guide that covers what girls need to know about their first period. The information is clear, direct and comprehensive, and features common questions posed by girls and their parents. 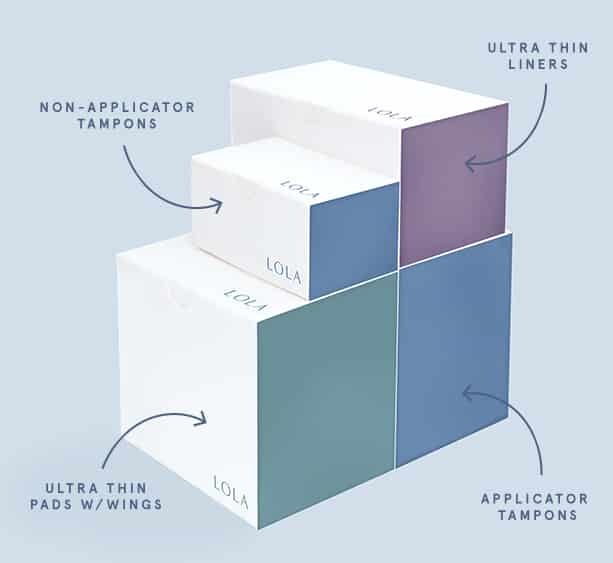 Lola Tampons are FDA approved, made from 100% organic cotton top sheet, 100% organic cotton core, plant-based waterproof backing, and non-toxic adhesives. The cotton is sourced in Europe and expands sideways for absorption and comfort. They’re absorbent, breathable, adaptable and soft with leak protection. LOLA tampons are also hypoallergenic and dermatologist tested. LOLA tampons do NOT contain synthetic fibers, fragrance or deodorant, chlorine bleach, latex, parabens, or formaldehyde. The plastic applicator is BPA free and the product is 100% biodegradable. Ultra thin lubricated condoms, personal lubricant, and cleansing wipes are now available from LOLA. The 12-count ultra-thin condoms feature premium protection using trusted ingredients that don’t compromise protection. The mess-free 50 mL personal lubricant is water-based and designed to mimic your natural moisture. And the all-natural cleansing wipes are designed to maintain your natural pH balance while leaving you feeling fresh. The first box you order from MyLola is discounted in price so you can sample Lola tampons, albeit not risk-free. Yes, Lola tampons are made from 100% organic cotton top sheet, 100% organic cotton core, plant-based waterproof backing, and non-toxic adhesives. Since launch, Lola tampons reviews have been overwhelmingly positive with Trustpilot awarding MyLola a 9.2 out of 10 rating. Since 2015, LOLA has donated over 1,000,000 tampons to low-income women and girls in over 100 shelters in 60 US cities. LOLA partners with Support The Girls, Distributing Dignity, and Simply The Basics to distribute tampons to women and girls. Their philosophy is captured in the Twitter campaign, #TamponsAreNotALuxury, which is designed to spread the message that tampons should be available to every woman and girl who needs them, not just those who can afford them. Alexandra Friedman is a Dartmouth College graduate who went on to earn a Master’s in Business Administration from the Wharton School of the University of Pennsylvania. Thereafter, she worked at the Boston Consulting Group for a couple of years before joining Flurry Analytics, which was acquired by Yahoo in 2015. In 2014, LOLA was born and in under 3 years garnered so much traction that a host of investors jumped on board to fund the seed and Series A rounds of LOLA to the tune of $11.2M. Jordana Kier is also a Dartmouth College graduate who earned her Master’s in Business Administration from the Columbia Business School. She has been a Manager of Artistic Planning at the New York City Opera and has brand name companies like Quidsi and Rent The Runway on her resume. Listen to more from Alexandra Friedman and Jordana Kier on the Radiate podcast with Betty Liu. Among the seed investors in LOLA is Neil Blumenthal, co-founder and CEO of Warby Parker. Warby Parker provides eyewear users with a sublime purchasing experience that rivals the experience Apple users enjoy when opening the packaging of an iPhone or iPad. LOLA follows in the footsteps of Warby Parker with a world class packaging experience that makes receiving your organic tampons ‘in-a-box’ delightful. Other LOLA investors include Dave Gilboa, Warby Parker co-founder, and Jeffrey Raider. Jeffrey Raider was co-founder and co-CEO of Warby Parker and subsequently co-founder and co-CEO of billion dollar men’s shaving company, Harry’s. ‹ Acorns Review 2019 – Invest Spare Change Automatically!